PT100 RTD 4-20mA temperature transmitter - Robert Owen Inc. The ROI-XMA series is a versatile family of loop powered 4-20mA RTD transmitters. Versions can be provided for Platinum RTD resistances, of 100 ohm and 1000 ohm impedance. Signal range can be custom scaled to alternate RTD temperature spans within sensor range. 4-20mA transmitter supply voltage may be from 7.5 to 36Vdc. Output circuit is reverse connection protected and filtered. ** 4-20mA signal uses a 2 wire connection. Resistance transmitter output is connected in series, with supply and measurement device. *** Mated connector adds additional 3/8” to height. Use spare PLC 4-20mA inputs for RTD temperature sensor measurement, with ROI-XMA RTD transmitters. 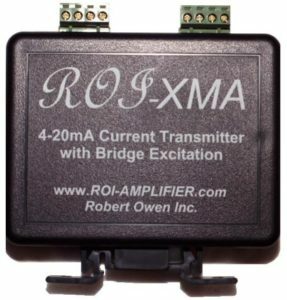 ROI-XMA RTD transmitters allow the simple measurement of industry standard RTDs. Existing RTDs can be connected to modern control systems. The RTD is a simple way to add temperature sensor measurement to a PLC.